After reading the header, do I hear you say that you have got this so many times? It happens with almost all of us. When we are young, from watchman to milkman, elder brother to grand father - everyone comes and gives us gyaan on various things! As a kid, I was always told how to behave, how to dress, how to talk and various other things. I was brought up in a small town in Gujarat. People there were pretty orthodox. Anything above the knee after the age of 10 was a sin! Wearing a short top on denim? Gosh, you are such a cheap girl! Yes, people are still this orthodox even today! A few people still raise their eyebrows when they see my tattoos, or see others wearing short dresses for a party, or a girl smoking.Well, I do know that each of us is entitled to an opinion, but when the opinion comes across as a negative remark, the problem starts then. We commonly know it as generation gap! So far, I was thinking that there exist a vast gap between me and elder people around me. I used to crib about how my mother does not approve of certain things that I do, certain clothes that I wear, certain kind of music I hear and movies I watch, late night parties, sleep overs etc. I always used to argue with my mother about how my friends were allowed to do certain things and I wasn't. Now, they don't tell me anything anymore as I am grown up. I have become "wise enough" to know what's good for me and what's not. Nobody gives me any lecture anymore on what I should or shouldn't be doing. Well, I was under the impression that I was a very "modern" girl until now. I happened to meet a friend's teenage daughter. I was talking to her. She was telling me about how her life is, what kind of a lifestyle she and her friends and plenty of people of her age have, how they party, have boyfriends since standard 7, how almost all her friends have a blackberry and an iPhone each! Phew! I was amazed to say the least. I couldn't give her a lecture thanks to my mindset of the "modern girl", but I realized that our parents are at least honest. They voice out what they feel about the way we live. We pretend to be cool about many things we ain't comfortable with. I will continue to live under the pretence, because I know how I felt about the gyaan I got from everyone around me. Whatever I think is good for me may not be so for someone else. Bah, I feel old suddenly! Time flies. Around this time, a year back, I didn't know what the hell was going on in my life. It was probably one of the most difficult phases for me. Things are not perfect now, but not so bad either. Back then, each day felt like a year, each moment crawled slower than the snail. And as they say, you know who your friends are when you are going through a rough phase. Same thing happened with me too. There were a few people who stood by me, whenever I needed them. And I was fortunate enough to have more than one such friends in my life. Another blessing was my two year old niece - one year old then. 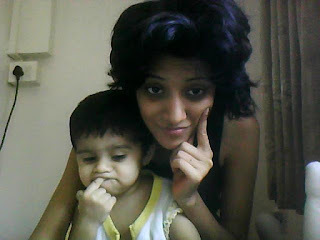 Her constant mischief, growing up days and her love kept me going. Such madness can keep anyone going. Many things changed during this period. My blogging reduced drastically and replying to comments became zero. My readership could have been negative too if it was not for you wonderful people. I complete two hundred posts. No matter how much one claims that one does not care about number of comments and readers, but you do care. If you didn't, then you wouldn't blog on a public platform at all! Yes, we don't always blog on topics that others like, but we never blog about topics others hate. Bah, I rant so much! And I got my second tattoo done. I had blogged about the first one too. Check archives to see it. I am off to Pune for two days. It's a very random trip, no bookings done anywhere whatsoever! And India lost the match! Sigh! In other news, my darling Guria is in India. I so wanted to go and meet her, but it won't be possible. I hope to meet her, and soon enough. And India lost the test series. One of the most pathetic performances ever given by the erstwhile world number one test cricket team. I am sad again! Obsessive Compulsive Disorder or popularly known as OCD. So many of us suffer from it. It is not a good or a bad thing. It is just there inside us. I don't know whether there is any cure for OCD or not, but if it drives you mad, then please go look for its cure! You might have heard this from many people that they are cleanliness freaks. Erm, to be honest, cleanliness freaks is more of a fashion statement than an OCD symptom thanks to Monica of Friends. But I do know certain people who suffer from an extreme case of OCD when it comes to cleaning. A friend of mine suffers from such an OCD. She has to clean each and every corner of her room. Everything has to be kept in its own place. She does not like it if you leave the mobile charger in the switch board, or comb on the dressing table, or clothes behind the door. She even arranges her wardrobe in colour coordinated manner - all blacks together, whites together, different sack for formals, semi formals, casuals, Indian wear, Sarees - phew! When we were doing our masters together, we had gone to pune to appear for the exam. Now I suffer from OCD too. I cannot study in a very clean room. I have to have all my books around me when I sit down to study, whether I refer to them or not. I sit with the books of other subjects too, whether I have that exam or not. This makes me realize that I am done with my studies now. Ah I miss it! Talking about my OCDs, my worst OCD is about reading. Once I start a book, no matter how pathetic it is, I have to finish reading it. I will give up on my sleep, my peace of mind behind that awful book, but I have to read the whole damn thing! How clean is your desktop? I have to have items in odd numbers on my desktop. 3, 5 or maximum 7. More than 7 items on desktop makes me uneasy. Each night before sleeping, I clear chat history if it is there. I cannot keep any mail unread. If I am in hurry, I will open it and close it again, but I will not leave it unread. Any unimportant mail goes directly into trash. Trash is cleared too before logging out. Checking privacy setting every now and then is another habit! And those calculations. I have this irritating habit of adding the digits of car numbers while travelling. If I miss out on one, I become too restless. It is my best passtime while travelling. Even when I am walking and pass by any parked vehicle, I calculate the digits. I keep a track of milestones. I look for patterns in them. If any of the milestone is missing a pattern, I feel weird. When I was in college, I knew which pole had what number plate it. On railway tracks, the kilometres are mentioned on a plate, and I knew the whole pattern by heart! It scared my friends a lot, but that is how my mind worked then. Now I no longer look for milestone or pole patterns, though digit counting continues. Another habit was of remembering phone numbers and account numbers. I remember most of my friends' mobile numbers even today. I remember all my past and present account numbers. I remember my debit and credit card numbers, BB Pin, room numbers of the hotels I have stayed in so far - I am way too obsessed with numbers. Too many OCDs! Phew! But none of them drive me crazy anymore. There is no extreme restlessness feeling when I skip some number calculation. It is still there in case of reading, but that's that. I read only fiction, so it does not as such harm me, but yeah, I suffer from OCD. So, what are your OCDs? Or there is only one? Disclaimer: I am forced to write this post as there are various leading newspapers and magazines which are publishing blog posts without taking prior permission of the original author. Read on if you want to know about copyright laws and/or have been the victim of copyright violation, or come back to read when you become one! Every now and then I keep reading about how blog posts are being used by leading newspapers and magazines as a part of their regular content. Irony is that these newspapers and magazines do not even bother to take a prior written (or even oral) permission from the authors of the original content. Posts are getting edited, tweaked and published shamelessly! Around a year back, when I was as lousy a blogger as I am now, my posts were copied too verbatim by a site twice. They didn't even give a linkback. They simply mentioned my name as the author. No blog link anywhere, nothing. I sent them a mail informing them that I would take a legal action against them for publishing my posts without taking my permission. They immediately removed my posts and promised me that they would never publish my worthless content ever! Ah, what a loss for me! I lost an amazing opportunity to be a famous lousy blogger, but I know a few amazing bloggers whose posts were copied recently. These magazines and newspapers are respected and reputed names. When a newspaper recently copied a blogger's blog post, upon asking the newspaper editor said that they gave proper credit to the blogger. The blogger's permission was not obtained before publishing the post. Further, it was edited too. The matter will be resolved soon, but the way it was treated on social sites like twitter was very disappointing. A few replies were rude and vague. I have a very simple question: For how long these newspapers and magazines are going to take blogs and blog posts lightly? We write posts for ourselves. When we see other media channels making money and gaining readership by using our content without even taking our prior permission, it violates our copyrights that we have on the content. For any medium that wants to use any content of any person, first that medium has to take a prior written permission from the author. Upon the terms and conditions agreed upon by the author and the printing medium; due credit, publishing and re-publishing of the content, number of times the content to be re-published, period over which it can be re-published and such various terms are decided. In India, when a literary, artistic or dramatic content is copied without prior permission, or plagiarised by someone; it is protected under Indian copyright act. Further, Information Technology Act 2000 has certain provisions too for the protection of original content especially softwares. When a person whose content is copied without his/her permission, it is called as Infringement. There are certain acts which do not amount to Infringement. (Kindly click on the links I have provided. They are useful for you as they give you an insight of the laws relating to copyright to protect your original content). As per the Indian Copyright Act, when a person violates your Copyright, he is punishable with an imprisonment of minimum 6 months, but which may extend to three years; and a fine of minimum of 50,000 which may extend to 2,00,000 or both. There are various punishments for various kinds of Infringement, which can be found in the Indian copyright Act. You can contact me too if you want to know about a specific infringement punishment. It is a serious offense to copy someone's original content. These days, the leading newspapers and magazines are publishing original content of bloggers without their prior permission. Isn't it sad? Our blogs are protected under Creative Commons License. This license does not give permission to non-owner to copy the content of the blog without blog owner's permission. Still, these newspapers and magazines shamelessly steal content from blogs so that they don't have to pay any money to the writers for such articles. Further, they say that they are a huge platform and they are obliging bloggers by publishing their posts and giving them due credit. This, according to them is much more than the monetary compensation. For such a feature, they don't even find it needful to take the permission of that blogger. And a few fools like me still swear by ethics! There is a difference between Plagiarism and Copyright violation. When someone uses your original content unde his/her name and claiming it to be his/her original content, it is called as plagiarism. While copyright violation is when someone uses your original content, publishes or re-publishes it without your prior consent, it amounts to copyright violation. Yes, I am angry. And I have written this post so that in future when famous brands copy your content without taking your permission or without giving due credit, you can refer to this post to know whether or not they have violated your copyright. You can even contact me in this matter as I have done my masters in Law in Intellectual Property Laws. I have written a thesis of 200 pages on Infringement. Whoever is interested, I can mail them a copy for their reference. Mind you, that theses is my copyright, so dare you borrow it to copy and publish it in your "famous" newspaper!